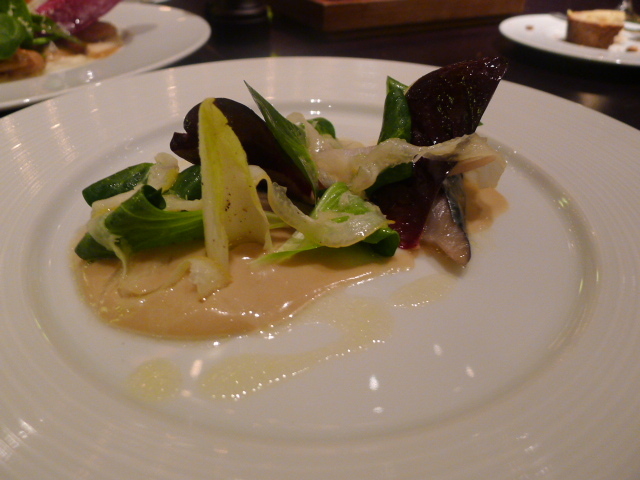 Yep – somehow I managed to score another reservation at Dinner by Heston Blumenthal. I know I only a few weeks ago (check out that post here), so I debated whether I should go again so soon. But in the interests of research (and for another taste of that meat fruit), I thought why the hell not? So this blog post will be a little different to the others. I won’t be talking about the things I covered the last time such as the décor. Instead, I’ll focus primarily on the new dishes I tried on this second visit. But it’s a little hard to past up a mention of the meat fruit (£12.50 – c.1500). It again delivered the ‘wow’ factor to my dining companions who were new to Dinner. The meat fruit looked and tasted great, although it was served a little too cold. This truly has to be one of the most dazzling dishes to grace London tables of late. JL went for the hay smoked mackerel (£14.50 – c.1730) with lemon salad, gentleman’s relish and olive oil. The mackerel was lovely, and there was a wonderful balance of acidity in this dish, especially from the gentlemen’s relish. (For a copy of this recipe which was published in The Guardian, click here). I selected a dish that I wanted to try last time but didn’t order, the Rice and Flesh (£14.50 – c.1390), which is a saffron risotto finished with mascarpone and parmesan and topped with little bite-sized pieces of calves tails in red wine sauce. The risotto was tasty, and surprisingly, quite tangy, but the acidity helped to cut the richness of the scrumptious calves tails. We also ordered the salamugundy again. This is a well made plate of food, but trying it for the second time convinced me that this is a rather dull dish. 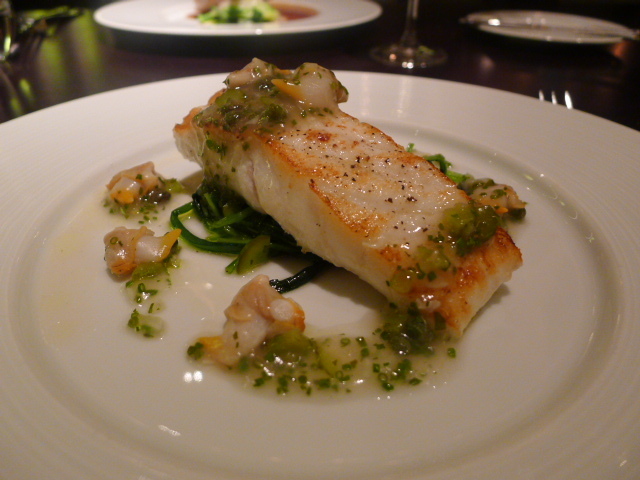 The only new main that I tried during this visit was the roast turbot (£32.00 – c.1830) with cockle ketchup and braised chicory. The fish was absolutely beautiful. Cooked to an opaque colour, it was moist and flaked easily. The cockle ketchup, made from mussel stock, produced a perfect balance of acidity for the dish and gave way to juicy pieces of meaty cockles. SG loved the tipsy cake tipsy cake with spit roast pineapple (£10.00 – c.1810). This really is a fantastic dessert, and I enjoyed it no less the second time around. 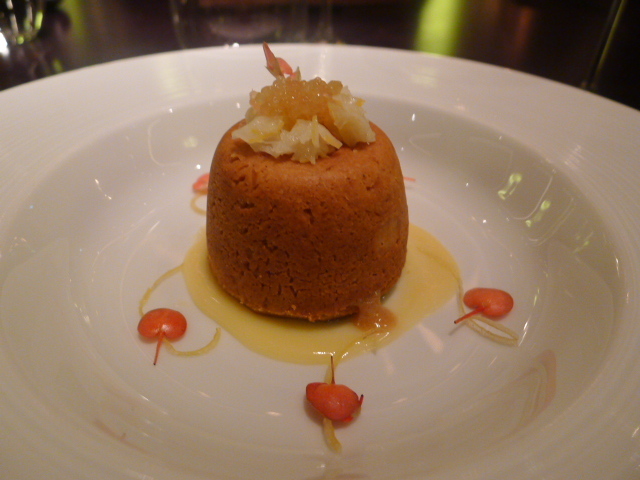 For something new, I went for the baked lemon suet pudding (£8.50 – c.1630) which wasn’t listed on the menu last time. A good crunchy pudding, it worked well with its scrumptious runny lemon suet centre and the accompanying caramel and Jersey cream. The service was again a little erratic. No one came to take our dessert orders until we asked to be served, and our appointed waiter was not as engaging as our South London Bermondsey waiter from visit number one, albeit no less pleasant. Admittedly, I didn’t find this visit as exciting as the first. I didn’t have that same sense of anticipation that came with trying one of the hottest restaurants in London for the first time. But this second visit still managed to reaffirm to me what a great restaurant Dinner is. The food was pretty spot on, and I still had some ‘wow’ moments. Like I said before, go if you can. Glad you tried the turbot, that’s what I had on my visit. The fish and the cockle ketchup were amazing, but I really didn’t enjoy the chicory when I had it. It was far too chewy and bitter, and I actually ended up leaving some of it. That was a shame, but the rest was fantastic. I’m guessing you didn’t have the same experience. Twice! Gracious me. Spent three hours trying to get a booking for July when the calendar opened up the other day. No avail. Lucky for me I can vicariously visit through reviews like yours. Thanks for shining a light on some of the lesser profiled dishes. A great write up, as always. I know its difficult to get a booking. I didn’t have the experience of the bad chicory. Shame that you didn’t enjoy it so much. I know its difficult to get a reservation. You are soo lucky! I am still trying to get a reservation. The task seems impossible and you got in twice in as a many months! worth spending several hours hanging on the line or just wait until the hype is over you think? :) the meatfruit though…hmm, make my own? That’s a tough one. I have no patience for waiting. That said, the restaurant is definitely worth a try.